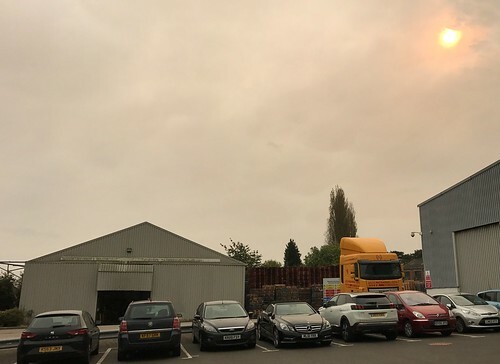 Not the most attractive of views, but ten steps out of the reception door where I work gives me this - today with added weird sun and sky due to hurricane Ophelia and Sahara sand. Looked like that in my part of London too, suspect a big storm is coming. It really looked and felt as through there should have been a storm, but it cleared up a couple of hours later and was beautifully sunny and clear. Where would we be without our weird weather! That is one bizarre sky. Wow. Be careful breathing out there! It was very spooky - but cleared up and was beautifully sunny a couple of hours later! That is a really good capture of the weird sky today. Thank you - my phone did a much better job than my camera did at taking the picture. The colours and shape of the sky is certainly something special! I hope you're not having or going to have any troubles due to Ophelia, though! Thank you - it was a very spooky and interesting sky for a few hours. It was beautifully sunny a couple of hours later and all we got was some high winds from Ophelia so were lucky there, thanks. It certainly was a bit creepy. It had a very 'end of days' feeling to it for a while! It was weird and you have caught it really well in that shot. Thanks - right place right time I think, a perfect break in the clouds. It was very spooky for a while! That is a great photo - we had weird colours in the sky at the beginning of the week, as well.